This gorgeous holiday home can accommodate 11 people in 4 bedrooms with 2 bathrooms. 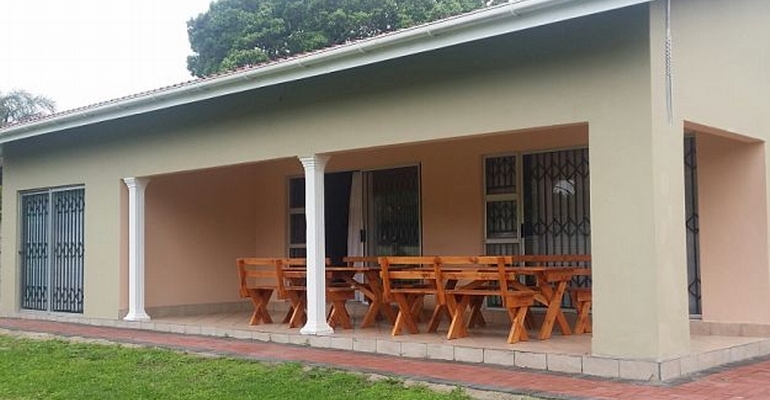 Located in Park Rynie on the Umdoni Coast of KZN, it offers a peaceful and private family get away. Pets are welcome with prior arrangement. The first and second bedrooms each offer queen-size beds, the third bedroom has 2 single beds, and the fourth bedroom offers a double bunk bed with an additional ¾ size bed. A sleeper couch has also been made available. The living area is open-plan with the lounge offering comfortable couches and OVHD Decoder, as well as an extra Connection point- please feel free to bring your own DSTv decoder and smart card along. The inside dining area seats 6 and leads out onto a large veranda with 2 large picnic tables seating 12. The kitchen is fully equipped offering a fridge & freezer, microwave, gas stove with an oven and ample storage space. There is also a washing machine available for guest use. There are 2 undercover parking bays and the property is fully enclosed, making it a great family holiday destination that includes your fur babies. Don't forget to ask about Special Rates for Deep Sea Fishing Trips on the "Wave Dancer" Charter. Bait and Tackle provided, you Keep your catch! From R550 per night. Please contact us for a detailed quote and availability. All bath towels are provided but please bring your own beach towels. Bookings are secured by receipt of deposit. A R500 refundable Key & Breakage Deposit is payable upon arrival. Please arrange a certified copy of your ID and banking details for reimbursement purposes. A kitchen inventory is provided and must be completed and handed in. No Loud Noise or Public Disturbance is Permitted.